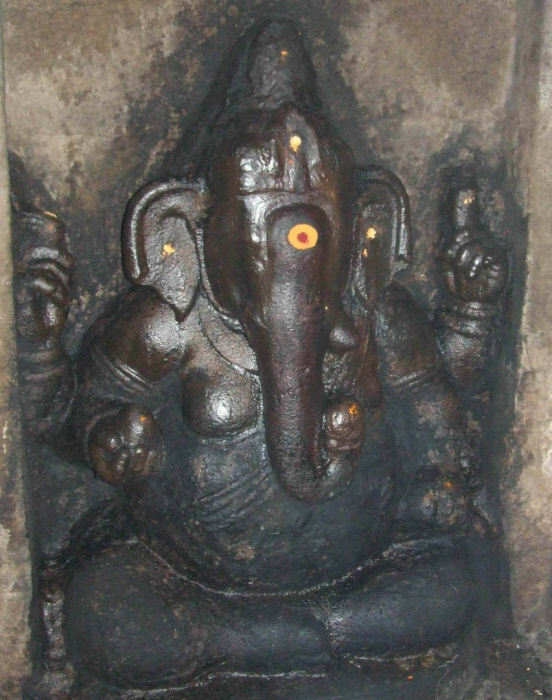 The Ganesa is huge, seen seated in cross legs on an elliptical pedestal formed above the southern niche floor.16 His back hands are in kataka and carrying sugarcane in the right and broken tusk in the left.17 Among the front hands the right is carrying motaka and the left hand is holding the knot of the idaikattu.18 His locks are arranged as karanda makuta.19 Head ornament, charapali, armlets, bangles are the other ornaments worn by him. 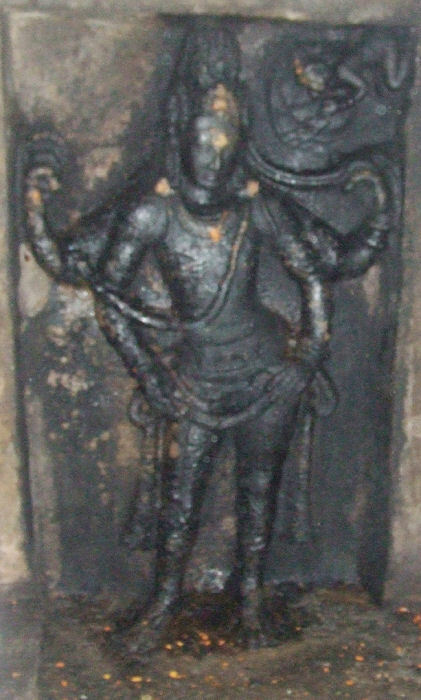 The lower garment is draping upto his ankle with idaikattu above it and the yajnopavita is with four strands, worn in upavita fashion. His proboscis is left turned holding a motaka. Ears are elongated and decked with makarakundalas, charapali and kandigai adorns the neck and the small fingers are adorned with rings. Yajnopavita is worn in niveta fashion. Among the front hands the left hand is in katyavalambita whereas the right hand is in kataka near the right thigh.21 The sculptor handled the posture brilliantly; the spaced out legs give a raise to the left hip in turn balanced by a twist in the upper body. The front hands on the hip and the firmness in the face makes him more stylish. It speaks volumes on the dexterity of the artist. Comparing the Gangadharas of Upper rock-cut cave of Thiruchirappalli and Thirugokarnam, the former is grandiose and elaborate where as the latter is simple, elegant and unbeatable. The Ganges is shown on the top corner to the left of the God near his makuta. In anjali hasta she is genuflecting to embrace the God. The god in his turn extends his braids for her easy descend. Lines are drawn to represent her descend from the clouds.22 She is shown with a lower garment upto knee and also a breast band. Her locks are arranged as jatamakuta with tail formation in the crest and chenni adorn her forehead. Head ornament, patrakundalas, chavadi, anklet are the ornaments worn by her. Her posture expose her relinquish to the deity. Nearly twenty five inscriptions are copied in this temple complex.23 Out of which eighteen are published in the IPS24 and seven published by Aavanam in the 13th, 14th issues. Among the eighteen published inscription of the IPS, ten inscriptions were also published by SII, but numerous inscriptions remain un- copied. The next earliest inscription of the rock cut cave is the 17th regnal year inscription of King Maranjadaiyan (Varaguna C.E. 765-815) and the 17th regnal year of the king corresponds to C.E. 781-782.27 The inscription details that one Nakkancetti, also called Varagunavati Araiyan of Kalkuricci in Kavirpal of Vallanadu, endowed 15 pon of gold, which was collected by him through begging, for a lamp to be kept alight for ever for the Madevar of Gokarnam in Tiruvelpur. This gold was placed under the protection of the Nattar. A 8th regnal year inscription28 of one Rajakesarivarman mentions Sri Gokarnam in Tiruvelpur, a devadana of Kavirnadu (built in). A 9th regnal year inscription29 of one Rajakesarivarman records a gift of land for the upkeep of the tank called Kavirkulam at Tiruvelpur in Tenkavir-nadu by a brahmin of Merkillimangalam a brahmadeya of Tenkarai Thiruvalandur-nadu of Sonadu. An inscription30 (damaged and built in) of one Rajakesarivarman, records a gift of money for the payment of taxes. A 3rd regnal year inscription31 of one Parakesarivarman records the gift of a kalanju of gold for a twilight lamp to Madeva of Thirugokarnam, a Kavirpal of Valanadu. A 4th regnal year inscription32 of one Parakesarivarman records a gift of eleven kalanju of gold for an ever burning lamp to the Madeva at Gokarnam, a devadana of Thiruvelpur, a Kavirpal of Valla-nadu. A 37th regnal year inscription33 of one Parakesarivarman records of a gift of lands assigned as a free tenure to the Lord for food offerings during tiruvuttram festival and 1 pon of gold. Mention is made of the measure ‘Sulakkal’. The earliest inscription of the rock cut cave mentions the deity as Madevar of Gokarnam in Thiruvelpur in Kavirpal of Vallanadu. The early Chola inscriptions mention the place as Thenkaviranattu Thiruvelpur Gokarnam. The later Pandya inscription mentions the village as part of Thiruvelpur under Thenkaviranadu. Vijayanagara inscriptions mention Thenkaviranadu a revenue division under Jayasingakulakala valanadu. Some of the inscriptions mention Thiruvelpur as devadana and some refer Gokarnam as devadana. The grantha inscription of this rock cut cave is dated by scholars as C.E. 7th or 8th century and on the basis of grantha inscription the cave can be assigned with a period of C.E. 7th or 8th century. Besides, the 17th regnal year inscription of King Maranjadaiya alias Varaguna (C.E. 765-815) corresponds to the year C.E. 781-82.34 The Varaguna inscription confirms the existence of the rock cut cave around the end of C.E. 8th century. 16. ibid., ஜெ.ராஜா முகமது, ஆவணம்-19, 'தெற்கு மாடத்தில் உள்ள வலம்புரி விநாயகர் ல லிதாசனத்தில் அமர்ந்துள்ளார்'. P.178. Lalitasana mentioned by the author is wrong. 17. ibid., க.இராசவேலு, அ.கி.சேஷாத்ரி, 'பின்னிரு கைகளில் எழுத்தாணி மற்றும் ஒடிந்த தந்தம் பெற்றும்' P.175. But the deity is carry tusk and sugarcane. 18. ibid., க.இராசவேலு, அ.கி.சேஷாத்ரி, p.175. ‘இடக்கை தொடை மீதும்’. Soundara Rajan, K.V., Rock- cut Temple Styles : Early Pandya Art and The Ellora Shrines, ‘four arms carry parasu, pasa, modaka and kati hasta’ P.88. The weapons and hand posture mentioned by the author is wrong. 19. ibid., க.இராசவேலு, அ.கி.சேஷாத்ரி, ப. 175. kiritamakuta mentioned by the author is wrong. 21.ibid.,க.இராசவேலு, அ.கி.சேஷாத்ரி, ப.174,‘சடையைக் கோதியவாறு கடக முத்திரை காட்டியும் கீழிரு கைகள் கடிமுத்திரை காட்டியும் காணப்படுகிறார்’.SoundaraRajan,K.V.,Rock-cutTempleStyles : Early Pandya Art and The Ellora Shrines, ‘both hands in Kati’ the description of both the authors are wrong, the deity is just holding his locks and the front hands are in katyavalambita and kataka. water marking is also shown at Thirugokarnam. 24. IPS 6, 27, 28, 36, 39, 41, 54, 73, 102, 120, 183, 239, 530, 532, 590, 649, 682, 691. 26. IPS : 6. On paleography ground the inscription is stated as Pallava Grantha and period as C.E. 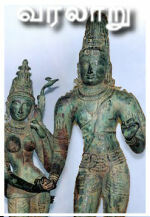 7th or 8th century by K.G.Krishnan.